who served with the British Army. Grater, Bertie William ’Michael’. 79th Armoured Division, British Army. 2003. If you can provide links to any published obituaries for any British Army Normandy Veteran, or their details, please add them to the comments box below. My father Geoffrey William Goodman, a Gunner in the Royal Artilery and part of the 2nd BEF in June 1940, has died age 94years on 26th September 2015. He passed peacefully attended by his family in his hometown of Sheffield UK . He sustained severe injuries in the retreat to Cherbourg on 17th June 1940, and survived where his 8 companions died, as the truck they were traveling in passed over a land mine placed by the French Resistsnce to defend the withdrawal of British Troops to Cherbourg. He lost his right leg and the use of his left foot, and had serious head and face injuries, but lived to marry and have children and to work for many years at Firth Brown Steelworks in Sheffield. He travelled to Denneville several times in the recent past to remember his fallen comrades, and is remembered by the Commune de Denneville, who forwarded flowers and cards to his family to mark his passing. He will be sadly missed by all who knew him..
Bush, Sergeant George. Aged 92. 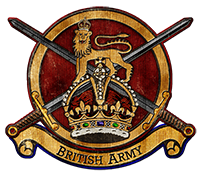 B Company, 2nd Battalion, The Cheshire Regiment, British Army. June 2014.